In basketball as with most other competitive sports, we constantly run the injury gauntlet. That is to say, every time we step on to the court, there is a chance to be injured. This is something that players of any sport accept. A particular thorn in the side of many basketball players however are knee injuries. Knee injuries dominate the statistics when it comes to injury types in professional basketball and are a constant source of anxiety to the players. This increased level of angst among players is seen for numerous reasons. While knee injuries can be very easy to overcome on the lower scale, they can also have a significant long-term impact on a player’s future career, possibly even cutting short a career on the more serious end of the scale. This uncertainty is what strikes fear in to the players. The fact that serious knee injuries are also on the rise in basketball is no source of comfort. Anatomically, the knee joint is the largest in the body. This size alone makes it more susceptible to injury during sports and activity. Bones, cartilage, ligaments and tendons all form part of the knee joint and conduct essential tasks. The femur, tibia and patella bones all come together to form the knee joint. Articular cartilage plays a vital role in the operation of the knee joint. Lubricating the bones of the joint, meaning the can slide smoothly against one another when the joint is in motion. The smooth interaction of these bones prevents any painful grinding which can sometimes be caused by damaged cartilage. Meniscal cartilage is present between the tibia and femur. This is a durable substance which performs a duty similar to that of a shock absorber in a vehicle, helping to cushion any movement and impact. This helps to keep the joint stable and in position even in difficult situations. Ligaments are what connect bones to other bones. They keep the knee joint stable and hold the bones together. These can be broken down into two types, collateral and cruciate ligaments. Collateral ligaments are present on the sides of the knee, medial ligament on the inside with the lateral ligament situated on the outside. The purpose of these ligaments is to control lateral motion of your knee and prevent any unusual movement. Cruciate ligaments are located on the inside of the knee joint. Here they form a crossover pattern with the anterior cruciate ligament (ACL) in front and posterior cruciate ligament (PCL) behind. The job of the cruciate ligaments is to control the back and forth movement of the knee. Tendons are what interlink the muscles to the bones of your knee. The quadriceps tendon connects your femur muscles to your patella and the patella tendon further connects muscles downward to your tibia. Patellar tendonitis is something which is endured by many basketball players, such as in the case of New Orleans Pelicans Alexis Ajinca earlier this week and that of Philadelphia’s returning Timothe Luwawu-Cabarrot. The knee is a complex joint with many moving parts functioning to control it at any one time. This presents a variety of injury risks is any part of the system is damaged or indeed multiple simultaneous injuries which can occur during contact sports. Analyzing the most predominant basketball knee injuries, our first stop is knee sprains and strains. Studies show that these account for the largest amount of time missed in basketball through injury. Knee sprains occur when the ligament becomes overstretched and damaged. The severity of these strains are graded on a 3 point scale, with a grade 3 strain being most severe. A sprain can occur in any of the four major ligaments of the knee joint although the most frequently diagnosed in basketball is an ACL sprain. These can commonly be caused by twisting, jumping or quick deceleration, all of which are common movements associated with basketball. Depending on the severity of the strain, players can expect to be sidelined for several weeks to several months if the injury is ACL related as shown in the case of Jabari Parker who has suffered two ACL tears quick succession, sidelining him long-term. In relation to knee strains, these are injuries to the muscle or tendons of the knee. Whilst also commonplace in basketball, they tend to be less serious and with a faster recovery period than ligament injuries. Otherwise known as jumpers’ knee, patellar tendonitis is an injury which afflicts a high percentage of basketball players, especially into their advancing years. It is caused by an inflammation of the patellar tendon which attaches the kneecap to the shinbone. Patellar tendonitis is caused by overuse and thus is common among basketball players due to the high level of strain exerted upon the knees over the length of their career. The mechanics of jump shots in basketball are one reason why there is an increased number of cases among players, similar incidences occur in the sports of tennis and volleyball. It is an injury which requires primarily sufficient rest and rehabilitation of the knee. The likelihood is an absence of at least four to six weeks to both rest and rebuild strength in the tendon. Most commonly referred to as a torn cartilage, a meniscus tear can be a painfully recurrent injury in basketball. It is often caused by sharp directional turns, sudden speed changes or twisting the knee in awkward positions, all of which are common in the sport. Although often able to heal with adequate rest, players frequently try to play through this injury in the early stages. This can result in a painful grinding of the bones and increased damage to the area. Somewhat injury prone, Joel Embiid of the 76ers recently had surgery to repair damaged knee cartilage. Depending on the severity, players can expect an absence of at least 8 weeks while a full recovery is made. Rushing the recovery period can lead to frequent re-injury. From the injuries we have discussed, the overwhelming majority can be treated using non-surgical means. This can take a number of forms, but, it will most commonly begin by following R.I.C.E. guidelines for rest, icing, compression and elevation of the impacted areas. This is especially true for low grade sprains and strains or meniscus tears. Effective rest is key to promoting recovery. Medication may also be prescribed to reduce inflammation and pain in the knee. Following on from the resting period, it is essential to engage in a thorough rehabilitation program. This allows the injury to recover well and become strengthened to prevent future re-injury. Research shows that engaging in rehab programs and incorporating strength building exercises is key to a speedy recovery, especially in the case of tendonitis. Strengthening exercises such as the straight leg lift, where, from a lying position with one leg bent and one straight, you lift your straight leg around one foot off the floor and hold that position for 20 seconds before lowering and repeating are vital when it comes to rebuilding knee strength after injury. After gradually rebuilding strength you should perform stretching exercises to increase flexibility and ensure full motion to guard against recurrence. The quad stretch is one example of an excellent exercise for improving flexibility and releasing tension which can lead to jumpers’ knee. This is performed by holding one leg behind your back close to the buttocks area from a standing position for 30 seconds then repeating on the opposite side. Many understandably wish to avoid the surgical route as this means a prolonged absence and testing recovery period. There are also question marks over the return performance of some athletes after undergoing knee surgery. This can be exemplified by the case of former Duke star, Harry Giles. His knee troubles have followed him into the NBA where he is yet to debut for Sacramento and performance questions still loom. 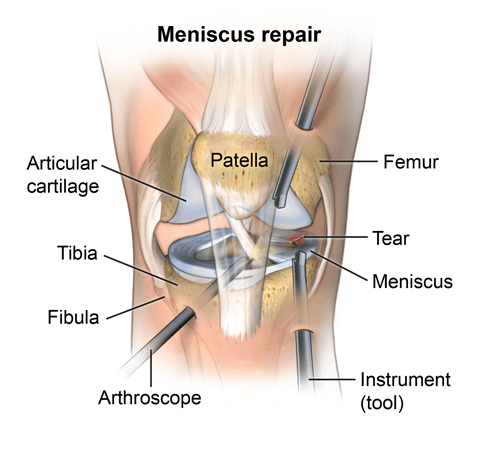 Arthroscopic knee surgery is the most common route for dealing with more troublesome meniscus problems as well as providing a solution to patellar tendonitis. This surgery tends to be minimally invasive and provides for an accelerated recovery time. Success rates are generally very high with this type of surgery. In terms of ACL injuries, reconstructive knee surgery may well be required. This would likely involve replacing the torn ligament with a tendon graft from the patellar or quadriceps tendon. Again surgery has excellent success rates and research shows that the majority of ACL patients return to play the following season, albeit with quite a reduce in performance among many cases. Supplementing the recovery options we have outlined, there are also a number of braces which can be beneficial in both protecting your knee from injury and helping to rehabilitate an existing injury. You can find specific knee braces for basketball players, but other braces can also work really well and it often depends on the nature of injury, so we will provide some more general info below as well. Functional Knee Braces are excellent for assisting the recovery process. They provide for a certain amount of flexibility and movement, keeping the knee mobile while also providing a high degree of support and protection. In patients with moderate grade ligament damage, a functional knee brace may be used in an attempt to avoid surgery. By performing some of the same functions as the damaged ligament, this type of brace allows the patient to rest and rehabilitate the injured area, yet continue with their daily life in many ways. They are also commonly used after ACL surgery in order to protect the new tendon graft during recovery. ACL Braces such as the Medi USA Protect 4 EVO ACL Knee Brace and others all offer great options when recovering, especially from ACL surgery. Rehabilitative Knee Braces are more limiting of knee movement that their functional counterparts and are designed to limit and control knee movement, usually in a post-surgery situation or in the immediate aftermath of a suspected injury as a matter of precaution. These braces like the Breg T-Scope are often removable and well cushioned to allow for a comfortable range of motion as well as convenient monitoring of injury progress. These braces are often hinged and stretching from thigh to shin. As the name suggests, they help to promote the most thorough of recovery processes by largely immobilizing the impacted area. Prophylactic Knee Braces are the most widely used when it comes to combatting low grade sprains, helping to protect a meniscus tear or taking preventative measures against jumpers’ knee. This type of brace allows the maximum level of movement and flexibility while still providing a good degree of protection and support to the knee area. For those reasons it is often favored by athletes as it allows them to continue playing virtually unhindered. Whether recovering from injury or being used as a preventative measure, these braces such as the Nike Combat Sleeve or others offer fantastically flexible options to safeguard your knees. Basketball is a highly competitive sport, played at an often time frenetic pace. With regular contact as well as the other unique situations it can present during shooting and drives to the basket, it becomes an inevitable hotbed for knee injuries. The most valuable points we can take from our analysis of basketball knee injuries is that there are a variety of preventative options available and if we do fall foul of injury, the path to recovery is well mapped out and prognosis’ are always improving in line with medical advancements. For many more articles on how to best equip and educate yourself on common sports injuries, be sure to check out some of our other latest articles investigating a number of sports and injury types.